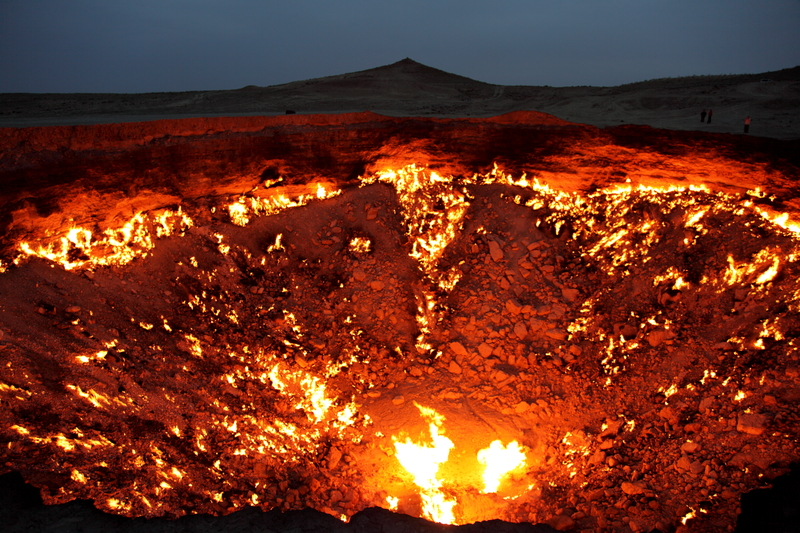 Proverbial “Door to Hell”, Derweze, Turkmenistan: Check out a video here. The Door to Hell is a natural gas field in Derweze (also spelled Darvaza, meaning “gate”), Ahal Province, Turkmenistan. The Door to Hell is noted for its natural gas fire which has been burning continuously since it was lit by Soviet petrochemical scientists in 1971, fed by the rich natural gas deposits in the area. The pungent smell of burning sulfur pervades the area for some distance (Wiki). Not the first time we talked about disasters on the blog. For example, about how Google worked in Japan post-Fukushima disaster to use Google-cars to help find missing persons. About how the intersection of infrastructure studies and disaster studies will likely grow in future years. More recently, we featured “Philip Mirowski’s Never Let a Serious Crisis Go to Waste … an important and distinctive contribution to debates around the politics and economics of the economic crisis”. This entry was posted in Disaster, Infrastructures in the making, International, STS, Teaching, Uncategorized by Nicholas. Bookmark the permalink. can’t really talk about engineering/infrastructure without addressing failures and the bigger the project/forces the bigger the fallout, now is work like the Manhattan Project an engineering success or a disaster in the making? there are certainly questions of social norms but also more technical questions of unforeseen consequences and inevitable material failures, raises many questions about what ‘expertise’ means in these areas and what ‘informed’ might mean on the political/social side. That is fair, but isn’t a study of deviant behavior still a study of behavior, or, in our area, a study of an engineering project disaster still a study of an engineering project … the specification is miry other than as advertising. That was my most basic point. sure, just noting that behaving/engineering is always already an affair of doing more than we can know/understand and not just a matter of merely applying calculative reasonings as engineers/scientists often suggest.